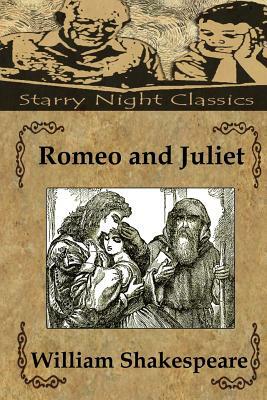 Join us for William Shakespeare's classic tragedy; one of the greatest love stories ever written. A bitter feud between the Montague and Capulet families has torn apart the city of Verona, Italy for many years. When Romeo Montague and Juliet Capulet meet and although forbidden, fall instantly in love. Risking everything, they marry in secret, hoping to one day unite their families, but things go horribly wrong. Can the doomed young lovers overcome hatred and find true happiness? William Shakespeare was born in April 1564, in Stratford-upon-Avon, England, the third child of eight. When he was eighteen, William married Anne Hathaway, who was eight years older. They had three children. From 1858 to 1592, there are no records mentioning Shakespeare, but it is possible that he was employed as a schoolmaster. By 1592, several of Shakespeare's plays were on the London stage and in 1594, he formed his own playing company, being awarded a patent in 1603 by the King himself. By 1598, he began to sell copies of his plays and in 1599, he constructed the Globe Theatre. He wrote his last known play in 1613 and died on April 23, 1616. He is buried at Holy Trinity Church. The famous plays that he wrote are too numerous to name here, but include "Hamlet," Romeo and Juliet," and "Macbeth."